“If ever two were one, then surely we.” So says the seventeenth-century poet Anne Bradstreet. These days, her portrayal of the marriage bond as one of unconditional mutual devotion might underestimate the complexity of the husband/wife relationship. The other poems in this vivid and entertaining mini-anthology go on to celebrate just that. Our selection offers moments of tenderness, romance and wry humour. There’s a poem in which a newly-married woman reflects on the “woosh” sound of the word wife and another where a man wonders about a woman he’s never met, as if he could have married her. We encounter a mysterious wife who arrives when the tide is right, while for Tiffany Atkinson a husband is like a farmers’ market, his heart “…a loom of many rhizomes”. 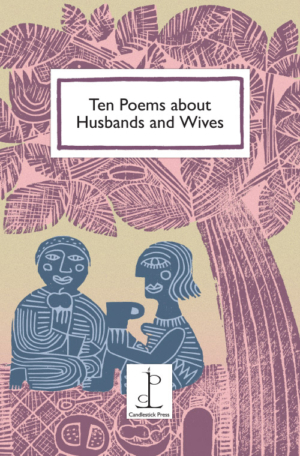 These beguiling poems are arranged in pairs so they speak to each other across the page – rather like a husband and wife engrossed in conversation across an old kitchen table. Poems by Moniza Alvi, Tiffany Atkinson, Mike Barlow, Anne Bradstreet, Angela Carter, Choman Hardi, Paul Henry, Ada Limón, Linda Pastan, RS Thomas and Tiphanie Yanique.